Yes, Raphael drew cartoons, but they weren’t what we usually think of as cartoons these days, of course. 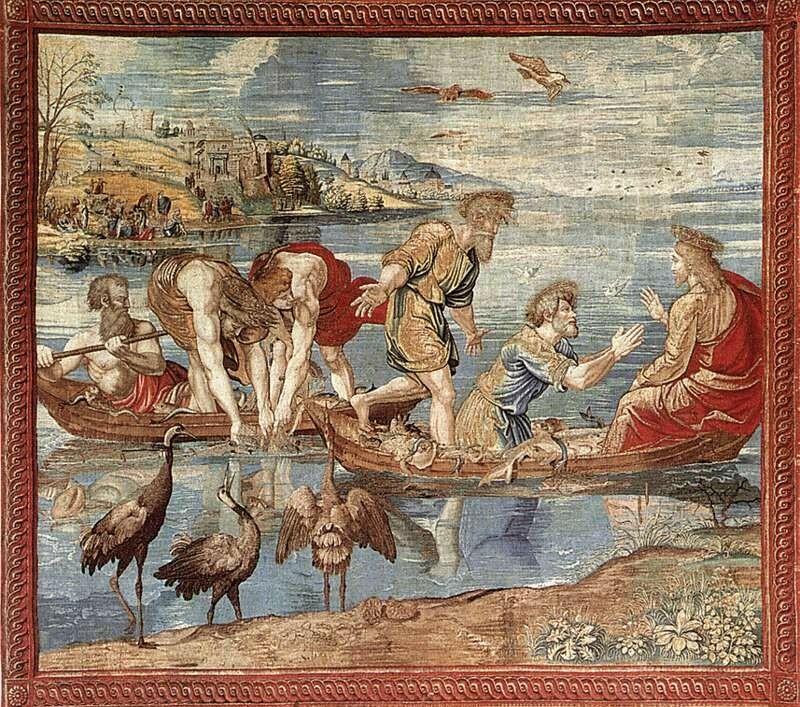 In 1515, Pope Leo X commissioned a set of 10 tapestries from Raphael to decorate the lower walls of the Sistine Chapel. He wanted to make a glorious contribution of his own to the chapel which his predecessors had decked out in stupendous works. Raphael was by this time an acknowledged master of Renaissance Italian art, but obviously he was no weaver, so the drawings would be sent to Brussels to be used as templates by the great weavers of Brabant. At that time tapestries were considered far more of a high prestige item than a fresco or painting. In fact, Raphael was paid 1000 ducats for his work, while the weaver got 15,000, more than 5 times what Michelangelo had been paid for lying on his back for 4 years getting paint in his eyes. By commissioning the great Raphael to design the tapestries and then have the pros actually make them instead of commissioning the tapestry experts to do both the design and weave as was customary, Pope Leo was creating something as memorable and unique in its own way as what Julius II had done by commissioning Michelangelo to paint the ceiling. 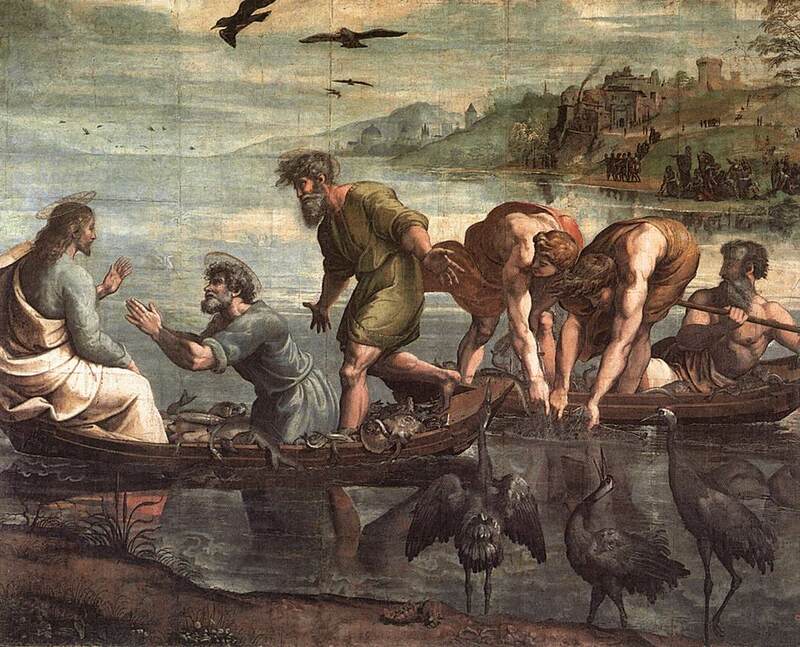 Over the next year and a half, Raphael drew 10 tapestry-sized cartoons on the lives of St. Peter and St. Paul. They were complex, thoroughly colored and really big, almost 10 feet high and from 10 to 16 feet wide. They were then shipped to the Brussels workshop of famed Flemish weaver Pieter van Aelst, where he and his weaving elves divided the cartoons into strips 91 centimeters (ca. 3 feet) wide, slid them under the vertical warp threads of the loom and wove that section of the tapestry. Since they made the carpet back to front, the tapestries turned out mirror images of Raphael’s cartoons. 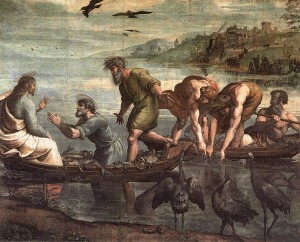 The colors also differ because they were limited by thread color so couldn’t reproduce Raphael’s pigments. Finally, all the pieces were woven together and the finished tapestries sent to the Vatican. Leo X put seven of them on display for Christmas in 1519, but he didn’t keep them up. Neither did his papal descendants. To this day the tapestries only come out on special occasions to keep them in as good a condition as possible. The cartoons stayed in Brussels for a while. Weavers were commissioned for years later to make copies from them. Henry VIII got a set. Some of the drawings were lost, but eventually Charles I of England bought the 7 remaining cartoons for a measly £300. When Charles lost his head, Cromwell didn’t sell off the Raphael drawings like he had with so much of the royal art collection, maybe because he wanted a set of his own tapestries made from them, maybe because they looked kind of crappy still in strips kept in a box. After the Restoration, the drawings started getting some attention as masterpieces in their own right. They were reassembled put on public display in Hampton Court where artists showered them with love. Prints were made from them, students copied them, and they came to be considered the epitome of historical painting. In 1865 Queen Victoria loaned them to what was then the South Kensington Museum and is now the Victoria and Albert Museum where they’ve been ever since in their own specially designed hall, the Raphael Cartoon Court. They’re too fragile to move so there’s no chance of them ever going on a tour to Rome, and the tapestries are extremely delicate as well. However, the Vatican and the V&A have put their heads together so that starting in September, 4 of the Sistine tapestries will go on display next to their mirror image cartoons in the Raphael Cartoon Court of the Victoria and Albert Museum. This is the first time ever. Raphael never saw them together. Pope Leo X never saw them together. This once in 20 lifetimes opportunity will only last just over a month, from September 8th to October 17th, 2010, coinciding with the visit of Pope Benedict XVI. Tickets are free but they’re timed so you have to book well in advance and show up when the ticket tells you to. You can book online for a £1 handling fee. Bookings open July 1st. I wouldn’t be surprised if it sold out pretty much immediately so get on it! And then tell me all about it because I’m hugely jealous. For more information about the cartoons and some nice pictures of them, see the V&A page here, using the menu on the left to navigate. This entry was posted on Friday, May 28th, 2010 at 11:26 PM	and is filed under Museums, Renaissance, Treasures. You can follow any responses to this entry through the RSS 2.0 feed. You can skip to the end and leave a response. Pinging is currently not allowed. With regards to Michelangelo, evidence exists suggesting curved scaffolding allowed him and his crew to do a lot of the work in standing. Charlton Heston was on his back a lot though in The Agony and The Ecstasy! love your blog! I’ve learnt so much!! I’ve never seen the cartoons either. I’ll have to look up the news about the scaffolding allowing Michelangelo to stand, although I imagine he still would have gotten a lot of paint in his eyes from having to tilt his head back. Paint in the eyes, a sore neck and back were the perennial complaints. Michelangelo claimed the paint specifically affected his vision for the rest of his life. Ooh, fascinating! I simply must get a hold of that documentary. Thank you for the tip.